Many users access YouTube, the Internet video portal, to see if somebody has uploaded a video with the best images from an interesting football match or to check if the new video clip by their favorite group is available. The bad thing about YouTube is that it doesn't offer the possibility to download videos to our computer to be able to watch them on another device, but we can always use YouTube Robot. 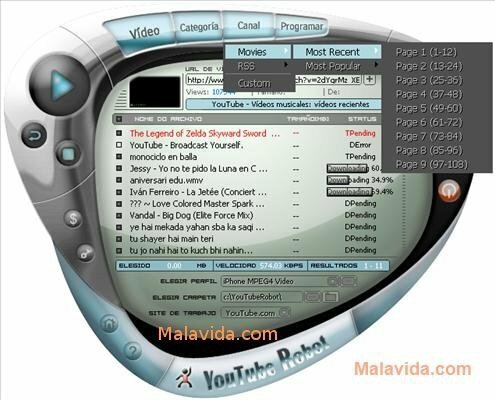 YouTube Robot is an application that has been specifically designed to download videos from YouTube and convert them automatically to the format of the user's choice. All you have to do is input a YouTube URL, and the application will start to download the video automatically. What's more, that application also offers the user the possibility to download the most important videos from each YouTube category with a simple click of the mouse. All the videos that the application downloads will be converted automatically once they are on the hard drive, with the possibility to choose between more than 40 different video formats, among which we will find the format for the iPod, PSP, PS3, Wii, Nintendo DS, Xbox, various mobile telephones, and common video (AVI, DivX, Xvid), among others, or even only audio format. So, if you need an application that will allow you to download videos from YouTube and that at the same time leaves them ready to be played on your favorite device, try out YouTube Robot. The trial period for the application lasts for 30 days, and it adds a watermark to the downloaded videos.